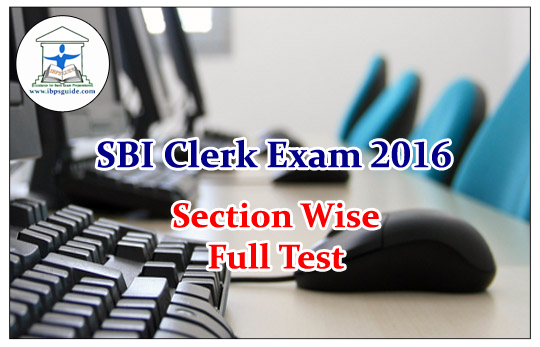 Dear Readers, SBI Clerk Mains 2016 was approaching shortly for that we have given the Section wise Full Test which consist of all the four sections such as, Aptitude, Reasoning-Computer, English, and General/Financial Awareness. 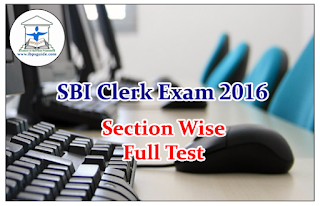 This Section wise Full Test will be provided on daily basis kindly make use of it. 4).The population of a town increases 4% annually but is decreased by emigration annually to the extent of (1/2)% .What will be the increase percent in three years ? 5).Tarun bought a T.V with 20% discount on the labelled price. Had he bought it with 25% discount, he would have saved Rs.500. At what price did he buy the T.V? Amit, Bharati, Cheryl, Deepak and Eric are five friends sitting in a restaurant. They are wearing caps of five different colours — yellow, blue, green, white and red. Also they are eating five different snacks — burgers, sandwiches, ice cream, pastries and pizza. I. The person wearing a red cap is eating pastries. II. Amit does not eat ice cream and Cheryl is eating sandwiches. III. Bharati is wearing a yellow cap and Amit wearing a blue cap. IV. Eric is eating pizza and is not wearing a green cap. 7).Who among the following friends is wearing the green cap? 8).Who among the following friends is having ice cream? And Step IV is the last step of the rearrangement of the above input. As per the rule followed in the above steps, answer the following questions. Which of the following steps will be the penultimate step? 15).Which of the following statements is not true about two-tier client server database architecture? 16).The World Blood Donor Day is observed every year on June 14. What is the theme of 2016 World Blood Donor Day? (A)In the circumstances, plastic money in the form of credit and other cards has become a preferred mode of payment and has wide acceptance among public. (B)Payments for purchase can be made in cash, cheque or cards. (D)With the increasing use of the plastic, the financial system is moving more towards cashless transactions. (E)In respect of cash, there is the limitation that bigger payments cannot be made in cash on account of the need to carry bulk. 21).Which of the following should be theFIRST sentence after rearrangement? 22).Which of the following should be theSECOND sentence after rearrangement? 23).Which of the following should be theTHIRD sentence after rearrangement? 24).Which of the following should be theFOURTH sentence after rearrangement? 25).Which of the following should be theFIFTH (LAST) sentence after rearrangement? 1). c)Let the sum be P.
2). c) Let the length of the train be x km and its speed y km/hr. Then, speed relative to first man = (y-2) km/hr. Speed relative to second man = (y-4) km/hr. 3). c)Suppose B invested Rs.x for y months. Then, A’s investment is Rs.3x for 2y months. S.P in 2nd case = Rs.75. In step I the word which comes first according to alphabetical order rearranges first. In second step the highest among the given numbers get arranged and occupies the place after the word arranged in step I. These two steps get repeated alternatively. Thus, in the last step all the words get arranged alphabetically whereas numbers get arranged in descending order. If any word or number is already arranged in any step, the next number or word is arranged. Step V is the last step. Therefore penultimate (last but one) step is step IV.